When I started flying with the 192nd, Phan Thiet was run by 2 light colonels, as far as I was concerned. The first was an older guy that came up through the ranks and for some reason thought chopper crews were next to dirt and treated us as such. Because of that he was given the same treatment back and we would cancel his missions out in a heart beat if anything went wrong with the ship and I do mean anything. I heard of guys dipping the mike of his headset in Nuck Mom, the smelly fish sauce the Vietnamese liked so much. If we took him to a compound we were to wait, by the ship, all day for him to return. No lunch or soft drinks or even water or a case of C-rations to play with. He was a real SOB. The other light colonel was a young tall West Point man and respect just flowed out of him like water out of a broken water hose. He treated his men well and got the same back two fold. When we landed someplace the pilots went with him and shared whatever he ate. He also had the same sent back to the ship for the crew. If he didn't need us he would tell us to get out of there and be back in so many hours. When we were told that we would beat feet out of there and usually head for the PX pad at Phan Rang. 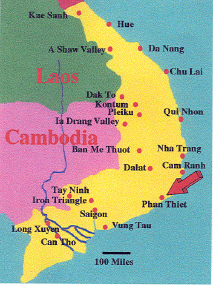 Because Phan Thiet didn't have a real PX we had money to spend and ration cards to fill up. When we knew we had to fly him for the day, others in the unit would give us their ration cards and we would get as much beer and soda as we could and still not get it in the way of the colonel. He understood and had no problem sitting in his seat next to several cases of beer and soda. Like I say, he had a real understanding of troops. It is a shame there were not more like him. Cpt. Casey or Cassidy, I don't remember for sure so I'll just call him Casey, was the good colonel's right hand man. Cpt. Casey had to fly all over the area and the only ship we could spare was always one of the two dog choppers. Cpt. Casey learned quickly, from the colonel, how to treat his men and treated us in the same way. I became his personal pilot sort of. Cpt. Casey had to go into the Dalat area several times a week and since all the good ships were needed for the combat assaults he always got one of the dog choppers. Sometimes it was just Cpt. Casey but most of the time we had other people going along as well. My first flight with him was up to Dalat and I was flying left seat. On the first flight with one of the ACs to be I would fly left seat to find out just what level he was at before I would switch seats with him. It would also give him a good look at some of the really tight pads we had to go into. On that first flight with Cpt. Casey he pestered me with questions about this and that. It was obvious that he was interested in flying and why we did things the way we did. He was the perfect candidate for flight school and I sure hope he took advantage of that. In any case, with him in the back seat, it was a real pain to yell back and forth while flying because of the high noise level. Not much got said because once the ship landed he had a tight schedule to meet and several compounds to get through before dark. Since Cpt. Casey had shown so much interest in flying I had the CE go to supply and acquire a headset and snap in 3rd seat for him. We were ready for him on the very next mission and was he ever surprised and impressed that we did that for him. Now he was right behind the radios and could see what we were doing up close and he didn't have to yell anymore. The first question he had was why did he always get the dog chopper. I explained that it was still a flyable machine but it was very under powered and we couldn't risk flying it in combat. It was either that or walk and he sure didn't want to do that. That was his permanent transportation. His second question was why me all the time and why was I in the right seat now. I explained that though he had the bottom of the barrel in ships he had the best of pilots for the situation. I told him that I had a lot of time in under powered ships, from my other unit, and didn't mind so much flying it. What would he rather have, me or someone that sure didn't want to be flying that machine and someone that was not use to under powered ships? As for the right seat, I told him that because of the under powered status of the ship that it was the perfect trainer for PPs that were just about ready to become ACs. Since the ship flew differently from seat to seat it took a little time to get use to the new view, without the instrument panel in front of you. Since their check ride would have to be from the left seat, this gave them time to get use to it and his missions were the perfect setting for that to happen. He was impressed because now he understood. His questions never seemed to stop and a friendship grew between us. I had only been flying Cpt. Casey a few weeks when there was a big battle that he was involved with. I was flying the colonel in a make shift C&C chopper and we were circling overhead as he was running the show. What a view we had from up there. Gun ships and assault ships were all over the place and the tanks were blazing away. We could even see the ground troops (US) in actual combat with Charlie. What a view, wish I had a movie camera back then. Then I about died when I heard the Colonel's orders over the intercom, he wanted to land. Things were hot down there and that's something you just didn't do with a C&C ship. Besides that I was in the right seat and I sure didn't want to go into a hot combat situation and not have my chin bubble to pad the cards a little. Down we went. A flare was popped and we landed to it. At least we were out of pistol range of the actual battle. The colonel got out and we kept the ship running just in case Charlie figured out that chopper must have someone important on it and come after us. Then something strange began to happen. The officers were all lining up, like in a formation and the Colonel began reading something. Something was up and I had one picture left in my little instamatic. Because of the glare on the windshield a shot from the seat was out of the question. Getting out of my seat was even more out of the question. The only thing left was to stick it out the window, line it up the best I could and shoot when something important happened. The colonel was saying something to Cpt. Casey and just as he began to step forward I saw the Cpt. start to salute. Before my eyes was one of the extremely rare battle field promotions of the Vietnam war. I snapped the picture but didn't say anything about it to Cpt. Casey or the Colonel. I doubted I got the picture because of the sun and such, besides that I had no idea if I got sky or ground or what so I kept my mouth shut. We went back up and the battle was pretty much over when the Colonel wanted to land again but to another area of the battle this time. We landed in the backyard of one of the town's outlying homes. There were troops eating and resting. A large bomb crater was to our right about 50 feet and a very large tree had been blown over into it and the crater had filled with water from the rice paddies. We could still hear sporadic shooting in the distance. We had been down only a few minutes when one of the soldiers walking along the edge of the crater opened up with his M-16 and sprayed the water in the crater. This scared the heck out of all of us. Out came 2 VC with their hands up and me without anymore film. Didn't phase the colonel any. Boy! They were close and the door gunner on that side of the ship sat the rest of the time with his machine gun up and at the ready. I don't think he blinked until after we were safely in the air again. My slides came back and I was surprised to find that the one I took of Captain Casey was nicely centered. I then sent if off again and asked for an 8" by 10" and 5" by 7" print made of it. A short time later they came back and looked pretty good. The next time I flew the Cpt. I waited for a while before telling him I had something for him. It caught him totally off guard when he opened the envelope. I believe he had a lump in his throat when he realized what he had in his hands. He just looked and looked at those pictures and time stood still for a moment for him. Finally he said "Thank You" and offered to pay for them. I said it was on me. He then asked why I had gotten the big picture. I said, "You have a wife don't you, that one is for her, you get the small one". He smiled and said "Thank You" once again. That was the end of the picture part of things but not of the friendship that it bonded. Cpt. Casey came away from that with a whole new outlook on chopper people. The dog chopper training went on with a new PP every week or so. We spent a lot of time in the Dalat area at a hodgepodge of compounds flying Cpt. Casey around. There was one landing site that was a real challenge though. Extremely large trees surrounded it on 3 sides with only about 10 feet of blade clearance on all three sides. It was really intimidating because the size of the trees distorted your depth perception if you focused your attention on them instead of the pad. I had heard that more than one pilot had simply refused to go into it. For my PPs it was their toughest test. You had to go in perfect or you would die if the blades hit the trees. Getting out was a real treat also. Because of obstacles we needed a bit of a running start to get out of there. That meant you had to hover back a bit, turn the ship around without hitting a tree, hover back past the pad and trust in your CE and DD to put the tail rotor between the trees while you were keeping the main rotor perfectly spaced between the trees on either side of you. This short added distance gave us the necessary running start we needed to get out of there with either of the dog ships. Many a time I had to swallow hard going into that one, and though I was on the controls, it was the PP's ball game. That pad was the turning point for virtually all those PPs. I felt proud when they cleared OK on the way out that very first time. I would always glance over to see the expression on their faces. With the first one under his belt I had the PP go in and out a few more times just for practice. Cpt. Casey was used to us shooting several practice approaches to his outposts. He approved of the training, just as long as we kept him informed and didn't run out of fuel. I never did get a picture of that pad, sure would have been a nice addition to the story. There comes a time in everyone's life when a challenge is presented and the result of one's decision will set the direction of travel your life will be taking. Some chose to take the challenge and some do not. Everyone of my PPs made it in and out of there and it showed them that they were in charge of things and not their surroundings. I was proud of them and glad that I had found my niche.